The first, An Englishman Abroad, was inspired by the real experience of the actress Coral Browne, playing Gertrude with the RSC in Moscow in a period of détente in 1958. Seven years after his defection, the “Cambridge spy” Guy Burgess invaded the dressing-rooms and asked her to “bring a tape measure” so he could order a suit from his British tailor. Their conversation reveals the aching loneliness and pointlessness of the exiled traitor’s life, and the actress’ response - half fascinated, half disgusted. Browne (Helen Schlesinger, crisply irritable) claims that “actresses are excused newspapers, as delicate boys were once excused games” but once exasperated after a long afternoon reproves him in basic terms: “You pissed in our soup and we drank it”. The second play - A Question of Attribution - is slightly longer and heavier going, but a richly rewarding meditation on art, reality, and value. It covers an imagined moment in the life of another traitor, Anthony Blunt, when he was given immunity - and anonymity until his 1980’s outing - but remained in charge of the Queen’s pictures. The scene everyone remembers is the one where the Queen has an oblique conversation with him, supposedly about a possible Titian forgery; but this riveting interlude is framed in his routine questioning sessions with an investigator, trying to identify the “fifth man” and beyond, Blunt being the fourth. The policeman Chubb (Alex Blake, a nicely chippy performance) duels with Blunt: Michael Pennington is elegantly patrician, engaging, clever, but projecting growing unease and fear of exposure. When Chubb, who claims to be learning art history, brutally says “Giotto had no grasp of perspective, and neither did you in the ‘30s”, Pennington’s irritable frightened wince is perfect. Schlesinger becomes the Queen, never an easy gig because it is too easy to caricature and too hard to find the monarch’s inwardness, especially in this play where she exists really as a disrupter of Blunt’s peace. But again there are a couple of lovely cameos notably Thomas Coombes as a footman. “Raphael? No school-of. I know, I dust it”. And again, the Bennettian melancholy: a sense of waste, of idealism turned to shiftiness, of conflicted loyalty and wondering how far a bygone principle was worth it. A master of lacing lines with both layers and bitter humour, Bennett’s signature style shines in these two one-act plays. An Englishman Abroad is set in 1958 in the Moscow flat of exiled English spy Guy Burgess, whilst A Question of Attribution takes place in 1960’s London where Sir Anthony Blunt’s past is beginning to catch up with him. In An Englishman Abroad, we witness the meeting of Australian actress Coral Browne (Helen Schlesinger) and the charming dangerous Guy Burgess (Alexander Hanson). Although he sleeps through most of her production, he invites her back to his flat asking her to bring a tape measure. This odd introduction sets the encounter off to a comedic but uneasy start. What follows is a scene in which Browne moves from dry one-liners about his situation through to a mix of anger, pity and amusement. Both Schlesinger and Hanson make the most of the awkward silences but also capture the wit of the text with their quick-fire banter. Does Burgess feel any remorse, is he happy in Russia and was the action worth the exile? Neither the audience or Browne knows by the end of the piece, but his Englishness cannot be mistaken or removed from his character. Referencing his suits, posture and accent, he points out that by conforming to being all things English, and yet being openly Marxist, his spy mask wasn’t a mask at all. “Guy couldn’t be a spy, he goes to my tailor.” The piece says much about the English character; the vignettes in each clothes chop are neatly played, and Burgess’s decision to remain An Englishman Abroad rather than to assimilate into Soviet life, is telling. With action taking place at both the Courtauld Institute and Buckingham Palace, A Question of Attribution is a good deal more colourful but no less chilling. This piece centres around Sit Anthony Blunt who, despite his political past, has continued to rise through the ranks of society with utmost respectability. He had been granted immunity by the English ‘powers that be’ but in return is assisting the police by identifying old photos of suspected traitors. Given that Blunt is an art historian, the arguments around what constitutes a fake and the context in which to assess it are eloquently expressed but delivered with a punch. As Blunt, Michael Pennington captures the passionate but often slightly vague quality of an academic whilst demonstrating a contrasting sharpness for some details. This delicate balance conveys a character that shouldn’t be underestimated and yet also makes it hard to believe that he was an effective spy. Schlesinger’s Queen is relentlessly forceful but poised and polished to the point that she is almost slightly sinister. Aware of her function, she learns facts and debates about them with double meaning dripping from her lips. Pennington visibly winces at some of the lines and, as the scene plays out, his Blunt becomes more and more uneasy about the parallels being drawn. Sarah Esdaile’s direction, like the piece itself, is precise with humour lightly played upon, but not overdone, and darker points emphasised but brief. Each of the pieces is a treat and the overarching, thought–provoking nature of both means that they compliment each other rather than fighting for attention. However, whilst the narrative is perfectly clear, a little light research before viewing will enhance the experience as these are two fascinating and well documented individuals. 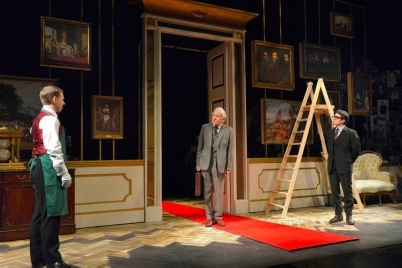 Alan Bennett’s double bill about double agents and double speak is a literate, challenging and always enjoyable meditation on our national character, even if Sarah Esdaile’s efficient and well-considered revival has a problem finding its focus in thin unkind, difficult auditorium. The first play, An Englishman Abroad, recounts the meeting of Australian actress Coral Browne with spy Guy Burgess in Moscow in 1958, when she was touring with Michael Redgrave as Hamlet (playing his mother Gertrude, although, as she says, scarcely five minutes older than him). The second, A Question of Attribution, set in the late 1960’s, places a senior member of the Cambridge spy circle, art historian Anthony Blunt, in conversation with an expert restorer in the Courtauld Institute, where he was the director, and later with the Queen in Buckingham Palace, where he was Keeper of HMQ’s pictures. When Prunella scales walked on the newly dubbed National Theatre as HMQ in 1988, this was the first time a living royal had been impersonated on the stage; now HMQs, and other royals, are two-a-penny, but Helen Schlesinger makes her both dumpy and curious in a fresh sort of way, just as she makes Coral Browne far more forthright than glorious or glamorous, playing against the “camp” that engulfed Burgess like a reviving waterfall. Englishman was originally a 1983 television film, directed by John Schlesinger (no relation of Helen), with Coral Browne playing herself opposite Alan Bates. And in the first NT stage version, Alan Bennett played the tailor whom Browne goes to see about ordering Burgess a suit in London before delivering a brilliant performance as Blunt. At the Rose, Michael Pennington is a desiccated, dry old Blunt rather than a sharp and brilliant one, but he has a sure command of the writing’s anecdotal shape and quality, just as Alexander Hanson as Guy Burgess - sliding suavely from one slimy, deceitful hedonist of the establishment, Stephen Ward, to another - buckles his performance to a marked sense of telling his own story as a distinct type of Englishman in exile. The anecdotage elides into a thrilling sequence of lecture-hall exposition with the “third man” of the first play revealed alongside the missing face in Titian’s “Allegory of Prudence” in the second. And when HMQ blithely relates Blunt’s expertise in Poussin to the chicken “one’s had for lunch, I suppose it’s fresh in the mind,” Bennett comes full circle to a music-hall pun in his tapestry of double meanings. Each play acts as an echo chamber of the other, the theatrical dimension in the role-playing of actors, spies and even HMQ, self-consciously aware of her “function.” The show conveys this admirably, not least in Francis O’Connor’s design of a battery of mug-shots that isolate the spy ring in a lighting coup (by Paul Pyant). Photography is usurped by art in the interval, as restored Renaissance pictures and slideshows uncover the witnesses before they are framed. Alan Bennett’s 80th birthday last May deserves celebrating not just as a point of respect for a formidable playwright but with awe at his continuing liveliness. More than 40 years after 40 Years On, he is still producing hits, and at Kingston’s Rose an opportune revival of two of his spy plays from the 1980s reminds us that the cuddly Yorkshire macaroon-lover with the swot’s glasses is quite the George Smiley: there are mercilessly observant eyes behind those lenses. It was under the last Soviet president Gorbachev, when the Cold War was a permanent feature of contemporary history still, that he wrote his plays about Guy Burgess and Sir Anthony Blunt, linked in the Cambridge spy ring of the Thirties. The earlier, An Englishman Abroad, was immortalized (and inoculated against future interpretation) by the magnificent TV version with Alan Bates and Coral Browne, who played - of course- herself, in a fictionalising of her meeting with Burgess in Moscow in 1958. The second A Question of Attribution, imagined the Queen chatting briefly, but lethally, with Blunt, when he was the Surveyor of the Royal pictures. In both of them a woman sees through a man, though he has been exposed in the first play, and deliberately not exposed in the second. The Blunt play is the more densely argued and anxious of the two, more about the value of truth than the first, which disguises the seriousness of the central question under a bravura drawing-room character comedy. The time lapse seems striking now. Bennett could not have forecast that the USSR would collapse a few years later, and with it (for a time at least) the espionage culture that he lampoons. Burgess and Blunt being upper-class were afforded an enviable freedom to behave outrageously and yet retain public standing because of the cost to establishment “face” of exposing them. A generation on, the spying and enemies have changed. As if to atone for past laxness, policing authorities have made the entire public suspect now. In this sense, watching these plays now is a bitter experience; the snobbery and dreadful negligence targeted by Bennett seem a particularly wretched basis for the cries today for total submission by the British population to surveillance. Hence it’s disarming to hear the simplicity of the idea in An Englishman Abroad that Burgess may have added so significantly to the gaiety of Whitehall and Soho that his fate to live out his days in Soviet deprivation, surrounded by an uncomprehending audience, was cruel and unusual punishment. Coral Browne - pointing out that she’s Australian, not British - takes an off-piste view that charm may take even a rascal a long way. But in a splendid hinge in their encounter she also sternly warns Burgess that making a fool out of people is a serious offence - and she isn’t fooled. In Browne’s comic rounds of Jermyn Street to acquire a “trousseau” of suits and pyjamas to allow Burgess to maintain old Etonian appearance even in Stalinist Moscow, one’s in danger of forgetting the core matter. He is, after all, something more than a charmer who waned off on a regrettable foreign adventure. Or is he? Bennett teasingly avoids the question. Sir Anthony Blunt presents a drier and less colourful personality, and one might almost fancy that Bennett was using Chubb, the cheerful intelligence officer who grills Blunt once a month, as his own mole into this secretive, enigmatic figure. The outrageous truth is that Blunt’s spying was known about from 1964 but a conspiracy of silence ensured that he turned informant against the Soviets in return for keeping his position - for 15 years. A parallel to Chubb’s pursuit of further members of the Cambridge spy ring arises with a Titian painting Blunt is investigating. X-rays have shown it contains a third, fourth and fifth figures at various stages. How important is it to the whole painting to have these figures uncovered? Blunt argues that it is of academic interest only. It’s a nice device, and provides much entertaining double-speak, like Blunt’s most damning admission, that even an art historian need not have “an eye”, the intuition to spot a fake. Fake though Blunt is himself, he can’t actually spot a fake. That it’s the Queen who seems to have the “eye” is a cunning playwright’s invention (the reality is that she had long known Blunt was a spy - Bennett labels these “imaginery circumstances”). I suppose my emphasis on the enjoyment of the plays themselves is a tell that I feel less enthusiasm for Sarah Esdaile’s production. The male performances are fine - Michael Pennington towers over the evening as Blunt, the perfect aristocratic mandarin, starchy, wary, examining every question before answering it. Alexander Hanson (recently as Stephen Ward) has the charm for Guy Burgess, though suggesting a man of no possible significance. Alex Blake as a winningly sneaky Chubb has a Bennettian peach of a line, where he describes visiting an art gallery as “profoundly disturbing”, in contrast to the reassuring calm of a museum. But Helen Schlesinger as Coral Browne and HMQ is much less persuasive - a pity given that this double-casting is the lynchpin of the night. Her voice is too light and unweighted to carry in the Rose, and she is more Estuary than Buckingham Palace in her Queen voice. She also seems curiously uncertain in her dynamic pitch of either character, and her wigs and clothes are also not good. The general lack of flair in the staging (especially in the first play) comes down to direction. When art historian and former spy Sir Anthony Blunt comments that ‘as a fake I shall, of course, attract more interest than the genuine article,’ he neatly captures the dichotomy at the heart of espionage, something beautifully conjured by Francis O’Connor’s evocative stage set which displays a montage of famous faces as the backdrop to the unfolding action. Revolving around the question of identity, specifically the public identities assumed by both Guy Burgess and Anthony Blunt during their spying careers, Alan Bennett’s double-bill of An Englishman Abroad and A Question of Attribution - first performed in 1988 under the title Single Spies – explores the fertile territory inhabited by these men in their complicated lives. The first short play set in 1958 conjures a meeting between actress Coral Browne and Burgess during his time in exile in Moscow. He and fellow traveller Donald Maclaine had fled England in 1951 and Burgess, who retained a love of many aspects of his homeland whilst still espousing Communism could, in Bennett’s words, state without irony ‘I can say I love London. I can say I love England. But I can’t say I love my country. I don’t know what that means.’ For him the appeal of home and the nature of England’s political identities were distinctly different entities. Both homosexual he and Blunt were very different men – Burgess a charismatic, freewheeling character who liked a drink, Blunt far more meticulous and fastidious a man – but neither seemed to harbour much regret for their actions, saying only ‘it seemed like the right thing to do at the time’ when asked about why they had embarked on careers in espionage. Coral Browne has no such qualms in roundly berating Burgess for his treachery (and the Establishment for their inherent snobbery), but Burgess himself – persuasively played by Alexander Hanson – remains unruffled and evasive, making the most of his house arrest and waiting for his daily phone call from his Russian bosses. In the evening’s second half, the life of eminent academic Anthony Blunt during the late Sixties is scrutinised. Occupying a distinguished position as Director of the Courtald Institute and Surveyor of the King’s Pictures, Blunt epitomised English respectability and his unmasking as ‘the fourth man’ in 1979 sent shock-waves through the country. For Bennett, having read about the discovery of a painting with an unnamed third figure attributed to Titian, the obvious metaphor for the shadowy life of a spy proved irresistible and it’s this topic which lies at the heart of the drama. Michael Pennington is excellent as the coolly composed Blunt, discomfited only when he unexpectedly encounters the Queen and has to endure some thinly veiled criticism related to his nefarious activities. Well-acted and intellectually (if not emotionally) engaging, the second play certainly feels a little long, and the dry humour and wonderful wit often associated with Bennett is conspicuous by its absence. With its focus on duality espionage certainly provides rich material for any writer though, and whilst not truly satisfying on dramatic terms, this double-bill does unequivocally stimulate the mind. If, as John Le Carre claims, the secret world is the true expression of a nation’s character, then spy mania and especially our preoccupation with the Russian spy yarn and the Cambridge Five is a fitting British obsession. The treachery of privileged toffs Kim Philby, Guy Burgess, Donald Maclean and Anthony Blunt - the latter gleefully outed as a spy by Margaret Thatcher in 1979 - continues to haunt public consciousness, not least because the conditions of the scandal’s context remain. Our leaders still conduct imperialist foreign policies and we still live in a climate of security paranoia. With Eton schoolboys at the helm and the class system intact, there’s never been a better moment to revisit Alan Bennett’s 1987 double-bill Single Spies. An Englishman Abroad is a comic account of actress Coral Browne’s visit to defector Burgess in his Moscow flat in 1958. The highly comic treatment means Burgess emerges as a marginal but likeable and rather pathetic figure who clings to his principles. A Question of Attribution is a more serious scrutiny of treachery through the lens of fine art attribution. Blunt, Poussin expert and keeper of the Queen’s picture, tries to identify figures that appear below layers of paint after cleaning and X-raying - an elongated metaphor for the hunt for the Cambridge Five. Like Le Carre, Bennett sees spying as a metaphor not only for how power works but for aspects of life more broadly. The secret, with its surface/depth divide, is inherently theatre and dramatic and it’s masterly play on whether things, or surfaces, can ever be as they seem. Director Sarah Esdaile provides an honest and unfussy rendition of both pieces, which showcase Bennett’s brilliant language to its best advantage. Its uncluttered, simple sets and lighting also provide space for the actors to shine and there are some glowing performances. One of the great Shakespearean actors Michael Pennington plays Blunt and, uniquely, comes up with a human, vulnerable and even fragile version of Blunt. Normally, he’s played as a distastefully effete, arrogant and urbane robot. But Pennington’s Blunt has a life of his own and if the actor swaps his usual power and charisma for subtlety and underplaying, the result is an intriguingly sympathetic character, powerless to defend himself against the ironic attacks of the Queen (Helen Schlesinger). She gives a vibrant performance and also doubles up as the irrepressible Coral Browne and the excellent Alexander Hanson is an elegant, rather contained Guy Burgess. There’s a fine supporting cast too, a combination making for a great night at the theatre. This line, uttered during both acts of Alan Bennett’s Single Spies, is not the only thing Guy Burgess and Sir Anthony Blunt had in common. Both men enjoyed a whisky, both openly gay and both were members of the Cambridge Five, the infamous spy ring who leaked British secrets to the Soviet Union during and after World War II. The Rose Theatre’s revival of Bennett’s award-winning double bill opened last week, and runs until October 11. The play is essentially an examination of traditional English values, and their transience. It opens with Act One, An Englishman Abroad,with Guy Burgess (Alexander Hanson) inviting Australian actress Coral Browne (Helen Schlesinger) to lunch at his grubby flat in Moscow, where he lives in exile following his outing as a double agent. The pair make small talk, while Burgess nonchalantly munches garlic, and convinces Browne to order him a new suit from Savile Row when she returns to London. For a man who betrayed his country, Burgess still has a deep love for the place, even fondly reminiscing about the British class system (“I am English,” he laments, in reference to his status in Moscow). But while Burgess is happy to pass the time listening to his one and only record (by Jack Buchanan, Browne’s ex-partner), Browne is more interested in talking about the giant elephant in the room - why he betrayed his country. Hanson and Schlesinger clearly have a ball - Hanson’s top lip quivering throughout with camp, comic timing, Schlesinger the embodiment of an outrageous, seasoned thesp. It’s an enjoyable watch without really catching fire until the final 10 minutes. The reason for that is not the performance, which are excellent, but with the story itself. Burgess is out, in more ways than one, and has little to lose now, bar his health (he died an alcoholic in 1963). Bennett is more interested in what became of Burgess, and how his decision effected his life afterwards. Burgess was only allowed to return to England until after his death, and the play asks whether his exile, in hindsight was entirely justified. When Burgess asks Browne what they say about him back home, Browne replies: “Not very much, these days.” Burgess seems genuinely deflated. It’s a poignant moment in an intriguing, and occasionally gripping, piece. In the second act, A Question of Attribution, the stakes are higher, and for that reason - at least from a dramatic point of view - it is the superior act. Because unlike Burgess, Sir Anthony Blunt still has everything to lose. Blunt (Michael Pennington) is the Surveyor of the Queen’s Pictures, an eminent Pouissin scholar and the subject of a police investigation into his past as a Russian informant. Bennett neatly frames the story through Blunt;s pursuit of the truth behind a disputed Titian painting. Having admitted his involvement with the Cambridge Five in return for immunity, he is forced to carry out his own investigation while simultaneously giving up information on his former co-conspirators to a dogged interrogator (Alex Blake), who himself has become well-versed in art criticism as a result of his dealings with Blunt. But it transpires that although Blunt may have immunity from prosecution, his anonymity, in the higher echelons of power, may not be so watertight. This is brought into play with great comic effect when Blunt meets the Queen (a pitch-perfect Schlesinger again), and the pair discuss the true value of a painting if is not by the person it is claimed to be. Every time the monarch refers to the work as a “fraud”, Blunt winces uneasily, repeating his mantra that a fake is different to something “that is not what it appears to be”. Pennington’s performance is brilliant, helped by his uncanny ability to seemingly age about 20 years every time he suspects Her Majesty knows more about him than she is letting on. The second act’s set also makes better use of the Rose’s space, coming to the fore during the play’s denouement. Single Spies is another piece of accomplished theatre by the Rose, and loyal to Bennett’s source material (even the reference to the Bentall Centre was, I’m told, true to the original).